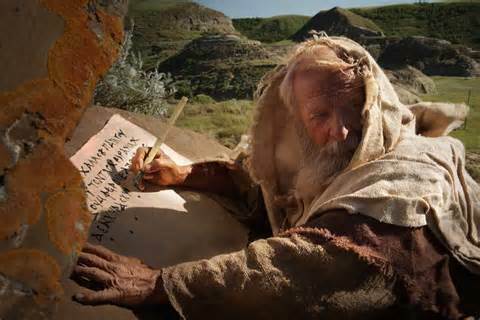 The letters were penned by the Apostle John, who wrote the book of Revelation. The churches to which he wrote were actual fellowships of believers in real cities during the days of John. Some Bible students have theorized that these churches also represent other things, or have other meanings.There is perhaps some additional significance to the meaning of these churches, but some of the theorizing concerning this begins to border on the ridiculous. Nevertheless, I think that we can say that the messages to these seven first-century churches are also messages to Christian churches everywhere, since a common phrase in all of these messages is, “He who has an ear, let him hear what the Spirit says to the churches.” The messages to these churches are messages that we should also hear in our churches today. Actually, it is not only these short messages that were written to the churches, but the letter to them also included the entire book of Revelation. It was a single letter that was meant to be delivered to all of these churches, and probably other churches in that area as well. In those days, there was no pressing the “carbon copy” icon in the email. The common method in that first century was to circulate the written letter from one church to another, so that all could read it and even make copies of it. As you know, the book of Revelation is largely about events surrounding the final days upon the earth – about the end of the age. The churches in that first century, when they read about these events, they probably expected themselves to see many of these things happening in their own lifetime. They had no idea that they it would be millennia before many of these things would take place. In the short messages to each individual church, we read of some of the problems of these seven churches. Coupled with the warnings to each church, there was also a promise given to them if they listened to the warning and obeyed. I do not know how these churches responded to these messages, but presumably, they took the warnings and promises quite seriously. After all, the rest of the book of Revelation talks of some horrible events that were to take place. These churches would have no doubt felt the need to be prepared. As we now know, most of the things written in the book of Revelation did not occur in the first century. Some did, however. In addition to this, Jesus as well as the Apostle Paul likened some of these prophetic events to “birth pangs” (Matthew 24:8; Romans 8:22). Many of the events found in the book of Revelation have occurred all throughout history, in varying degrees. It truly is very similar to an expectant mother going through the birth pangs of having a child, because these painful things upon the earth will become the most severe as we near the end of the age. However, the difficulty with these birth pangs concerning the end of the age is that as time goes on, we tend to become inattentive. As the years pass, then the decades and then the centuries, we see that all of the most severe of events have not yet taken place. Like the story that Jesus told of the ten virgins (Matthew 25), Jesus has delayed his coming much longer than any of us thought that he would. We begin to become drowsy and fall into complacency, forgetting to be watchful. I know that all of this brings up many theological and doctrinal issues that we could examine, but the essence of the story was to teach us to be watchful and to be ready. Like the bridegroom of the story, Jesus has delayed his coming longer than perhaps any person would ever have guessed. But the lesson of this story of the ten virgins, and the lesson of the letters to the seven churches in Revelation is the same: If we are not vigilant about our lives, we may find ourselves suffering the consequences of not being prepared. 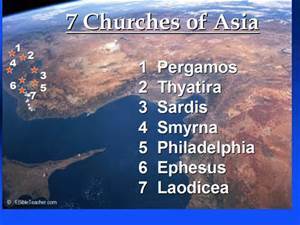 We may find ourselves wishing that we would have heeded some of these warnings that John wrote to these churches in Asia Minor. Paul wrote to his young protégé Timothy, “The Spirit expressly says that in later times, some will depart from the faith” (1 Timothy 4:1a). He also wrote, “Understand this, that in the last days there will come times of difficulty” (2 Timothy 3:1). Taking these words of admonishment together with many others like it in the New Testament, it seems to me that it does us no harm to often make an assessment of our walk with God. Considering these words of Paul’s along with John’s warnings given to the seven churches of Revelation, it becomes apparent that anyone who does not have a true faith in Jesus Christ the Sovereign God will abandon him when confronted with any type of severe persecution. It would be nice, I suppose, if we knew something about the various situations in the churches to which John wrote and why he wrote the things that he did to each church. Actually however, it probably best that we do not know. Indeed, even John probably did not know much of what was happening in these churches. After all, these words that he wrote to the churches were not actually his words. He was not acting as a church pastor or bishop or any kind of overseer. These were words that John was instructed to write. As an introduction to these letters, John writes who told him what to write. For this reason, when we read these words to the churches, it almost does not matter that we do not know about the specifics of each church, for they are words for us as well. As we read these messages, we would do well to ask, if Jesus were to send a message to the Log Church*(footnote), what would he say? It gets even more personal than that. If a courier showed up at your door one day, carrying with him a letter from Christ, what would it say? Would it say some of the same things that were written to the seven churches of Asia? 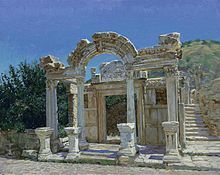 Would the message say, as did to the church in the city of Ephesus? “I know your works, your toil and your patient endurance, and how you cannot bear with those who are evil…I know you are enduring patiently and bearing up for my name’s sake, and you have not grown weary. I must admit, this first message is one that has caused me some sorrow on several occasions. Sometimes when the business and the busy-ness of life begins to crowd into my own life and when I find that I am looking to the same forms of entertainment as the rest of the world to take up the hours of my day, I find myself thinking back to the time when I first gave my life to Christ. More than just a few times, I have asked myself what happened to those days. In those early days with the Lord, I devoured the Bible, not able to satiate completely my curiosity and learning. This specific message to the church in Ephesus probably has done more to safeguard my priorities in life than any other words in the Bible. Along with admonitions and warnings that Jesus gave to the churches, he also had something positive to say about almost all of them, all of them except one. 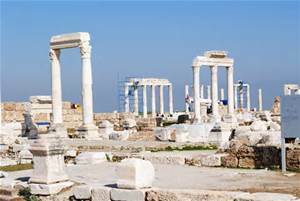 The church of Laodicea was the only church of the seven to whom God said nothing good. The people there received no commendation of any kind. wealthy. This city was a rich, commercial center of the area, and the church was one who considered themselves as being self-sufficient. But the opinion of Jesus was different. It is puzzling to me why we so easily equate a comfortable financial situation with security. This is not God’s perspective. It is the world’s perspective. Certainly, in this world, money is everything. However, if we step back and see the broader perspective of life, we come to understand that a few minutes of wealth in this present life does not compare in the least with the eternal crown of life that was promised to the faithful in the church of Smyrna. In contrast with the church in Laodicea, which was wealthy in the world’s eyes but impoverished in God’s eyes, Jesus told the church in Smyrna, “I know your tribulation and your poverty, but you are rich!” They were the ones who, if they remained faithful, were promised the crown of life. But Laodicea was the “lukewarm” church, seemingly having no passion to dedicate themselves to God. This insipidness is distasteful to God. “I will spit you out of my mouth!” he told the church. We might think this a strange thing to say. Was this not a Christian church, this Laodicean church? Were they not meeting in the name of Jesus? Presumably they were, and yet Jesus was left outside, knocking and asking to be let in. He was only waiting for someone to hear him and to open the door. And what about your own life? After all, the life of the church is only the sum of the lives of the individuals who gather. The spiritual life of the Log Church is only the sum of our own spiritual lives. How many of us, when we sense the Spirit of God wanting to make a change in our own lives, refuse to let him in? If we do not, is it any wonder that we cannot get victory over some events and practices in our lives? There are five other churches that are included in this letter. I simply do not have time to speak of each one of them at this time. Each is a message to a church who has its own unique struggle with the society of their day. Most of these churches had failed in one significant way or another. However, Jesus admonished and encouraged these churches to rekindle those good things that remained, and to return to his teaching. The truth is, we easily become confused in our priorities. Every day we see the changing standards in society of what is right and what is wrong. Quite often, things that were wrong in one generation are celebrated in the next. Sometimes these changes of our standards of acceptability are based on some remnant of the truth, but just as often, it is based purely on personal preferences. It is the culture of the moment and contemporary society that drives us, not eternal truth. We also become confused by what we see as being influential in the world. These are things like wealth and power and prestige. We forget that these marks of this age have nothing to do with the kingdom of God. But we have not been created to live only a generation here on earth. We have been built for eternity. If our lives are to have meaning, we must understand that what is important in the eyes of the world often means nothing in the eternal kingdom. Jesus said it best when he was on trial before Pilate. “My kingdom is not of this world…You say correctly that I am a king. For this I have been born, and for this I have come into the world, to bear witness to the truth. Everyone who is of the truth hears My voice” (John 18:36-37).